Domino offers 50% off Domino's All Pizza Regular Menu. Domino offers the $5.99 each Large 2-Topping Pizzas or Medium 3-Topping Handmade Pan Pizzas Deal. Domino offers the $7.99 each Large 3-Topping Pizzas or Medium 3-Topping Handmade Pan Pizzas Deal. 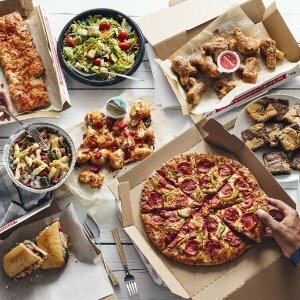 Domino offers 50% off Domino's All Pizza Menu Regular. 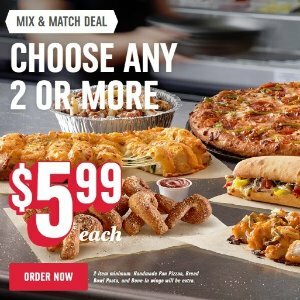 Domino's offers the Any Large 2-Topping Pizza for $5.99. 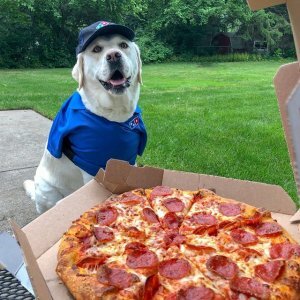 Domino offers the Domino's Large 2 Topping Pizzas for $5.99. 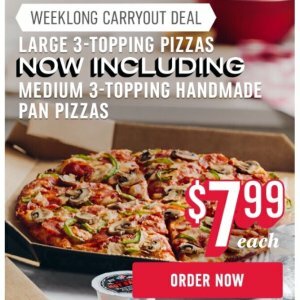 Domino offers the Domino's Large 3-topping pizzas discount $7.99 each. Also offers Choose any two or more handmade pizza, bread, pasta and bone-in wings $5.99 each. Order online, pick it up at store. 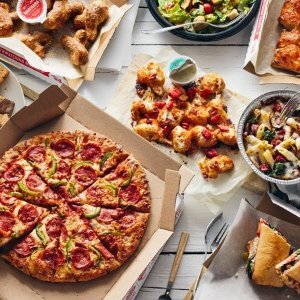 Domino offers Domino's Online All Pizza at Menu Price 50% off via coupon code "50OFF". 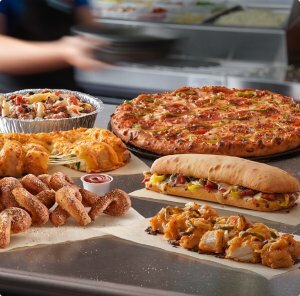 Domino offers the Domino's Hot Pick Bread Twists Special Deal for $1 via coupon code "TWSTHOLD". Domino offers the Domino Large 2-Topping Pizza Carryout Special Deal for $5.99. 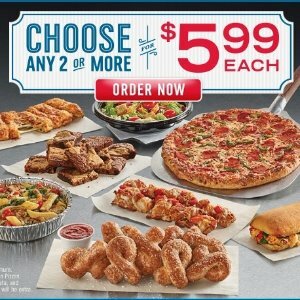 Domino offers as low as $5.99 Choose any 2 or more Domino's Wings, Bread, Pasta, Pizza via coupon code "9193". 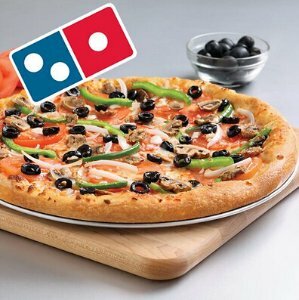 Domino offers Domino BOGO Online Order Discount buy one pizza get one free via coupon code "9206". 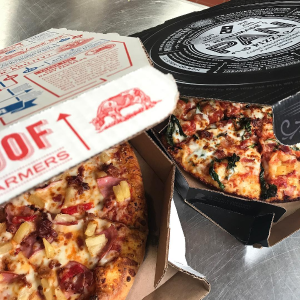 Domino offers the Carryout Orders Large 2-Topping Pizzas for $5.99. 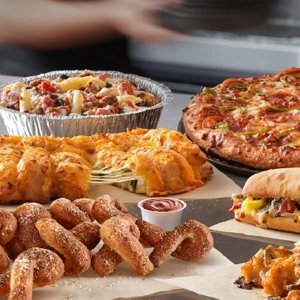 Domino offers 50% off Online order Pizzas. Domino offers 10% off Everything via coupon code "HOORAY". 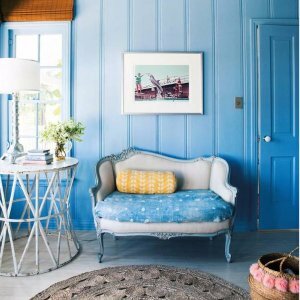 domino offers 35% Off Kate Spade New York Home Collection via coupon code "DEALMOON". Shipping fee starts at $8.95. 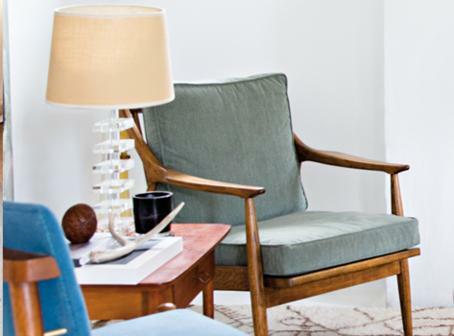 domino offers 20% Off Select Item Sale.